Jackets have always been a staple in our wardrobes, whether its for the primary solution of beating the cold or being used as a fashion statement. So what if I tell you there is a jacket that is going to take the world by a storm? This is a jacket that promises to do more than just keep you warm – it gives you a massage on-the-go! Tware is the Singapore wearable technology company that is making this possible. For the past 4 years, Tware has been focusing on the Tjacket, a wearable technology vest that serves to calm anxious individuals and children via deep pressure technology. 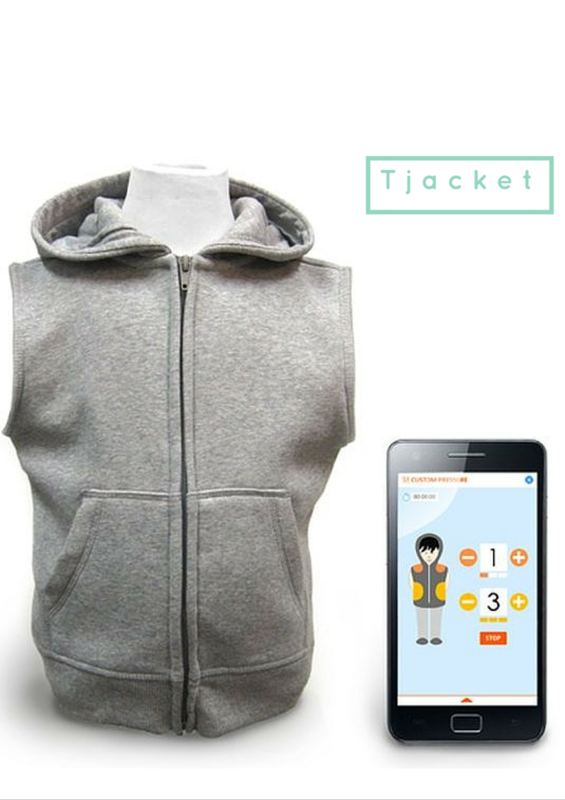 The Tjacket simulates the feeling of a hug, and uses adjustable air pressure compression that is controlled automatically via a smartphone app. A built-in sensor in the vest monitors user movement activity and their arousal levels to ensure that the figures fall between the optimal ranges. The team had worked with senior occupational therapists, university researchers, clinical psychologists and educators to ensure that the jacket would be of use to their intended users. Sore muscles, back pains and stiff shoulders are common problems affecting a majority of working individuals, who spend countless hours hunching over their desks. 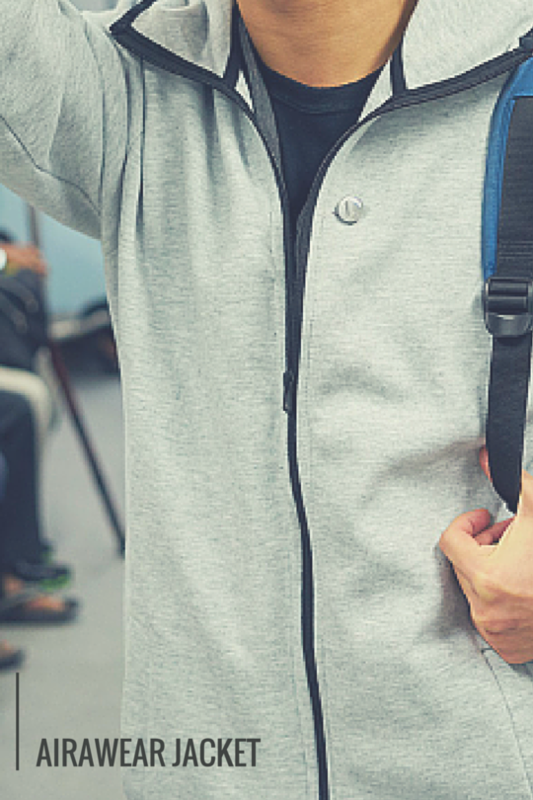 Long flights and commutes also contribute to that problem. Inspiration for the product came from the personal experiences of its creators – Tan Jun Yuan, product head of Tware, had been suffering from back pain from sitting too long in front of the computer while Constantinos Demetriades, CFO of Tware, was diagnosed with scoliosis, an impairment in the alignment of the spine. Experiencing first-hand how discomforting back pain felt and the long-term consequences of poor posture, the AiraWear jacket was born in a meeting room in July 2015. 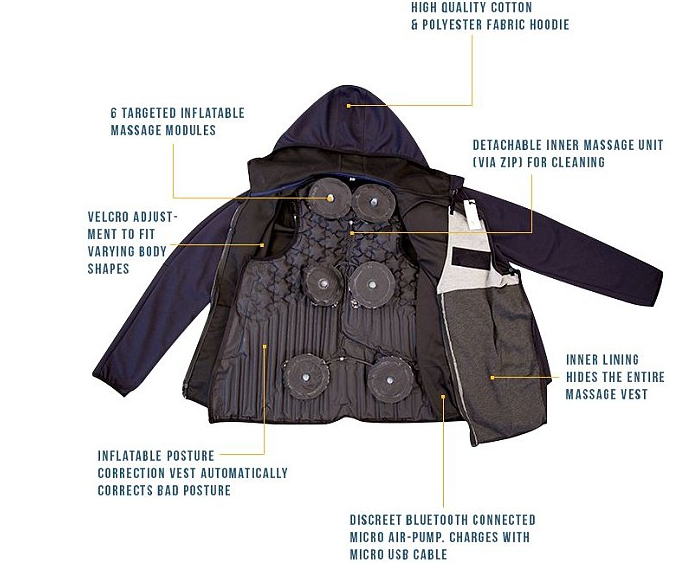 Wanting to provide consumers more than a hug jacket, Tware intended to use their proprietary pressure technology to help other groups of people. 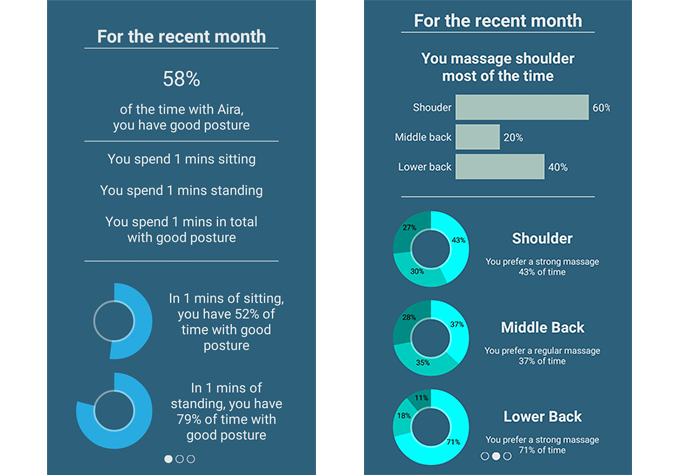 The AiraWear Jacket utilises ultra-thin acupressure technology that can analyse and improve your posture in real time to relieve the tension in your back – something like how the Tjacket also uses sensors to analyse user movement and arousal levels. 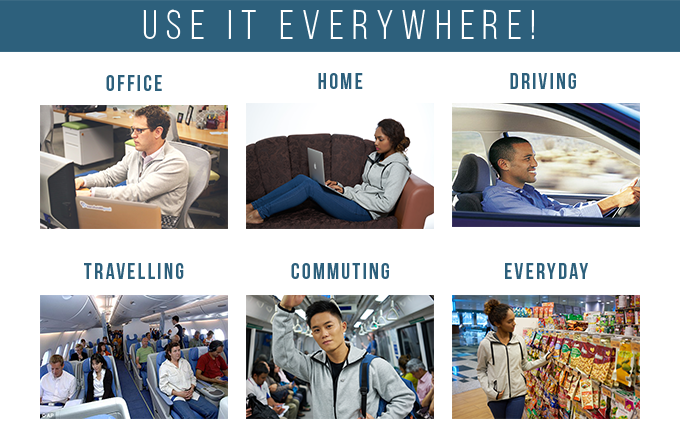 A personalised report of the user’s sitting posture and usage patterns of the jacket is also generated for health data tracking. 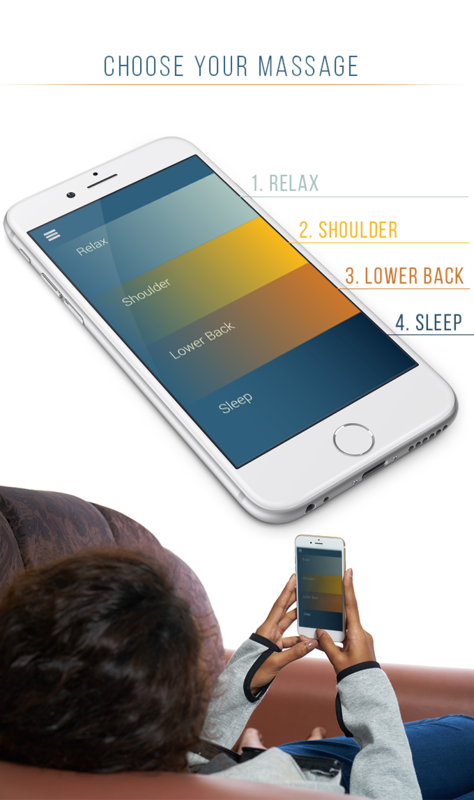 The massage settings are controlled via a smartphone app with a simple interface, and provides the smartphone generation a convenient and subtle way of getting relief for their aches. Not everything was smooth sailing for the AiraWear Jacket, however. After the jacket was first showcased at IFA in Berlin on September 2015, they realised that there were improvements to be made, and soon after touching down back in Singapore, they started tackling the problems and through countless repeated experiments, developments and the upgrading of the old prototypes. The changes worked, and the AiraWear became one of the most popular projects in the fashion category on Kickstarter at its launch earlier this month. 64% of the funds required was also raised by the second day – quite an accomplishment for a relatively young project. As of 23rd May 2016, they have raised 113% of the funds required. They also intend to release the world’s first intelligent comfort scarf, and it is slated to be launched next year. Looking to get it for yourself or someone else? Check the jacket out on its Kickstarter page!